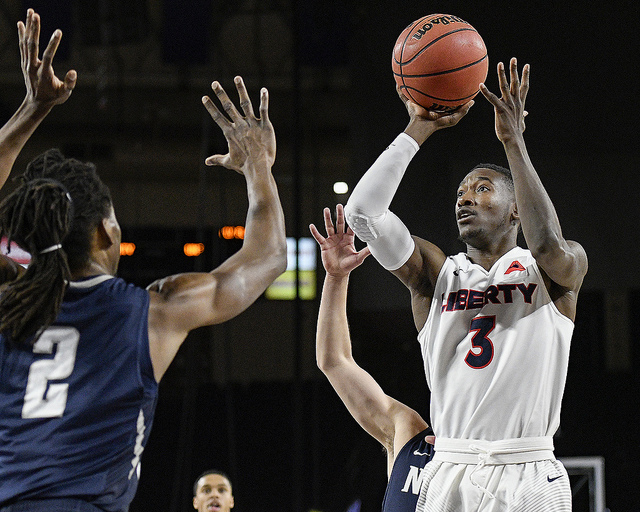 Liberty (28-6 overall, 14-2 ASUN) faces Mississippi State (23-10, 10-8 SEC) in the first round of the NCAA Tournament on Friday in San Jose. Tip-off is scheduled for 7:27 p.m. eastern time and will be televised on truTV by a broadcast crew of Spero Dedes, Len Elmore, Steve Smith, and Ros Gold-Onwude. The Flames are making their first trip to the Big Dance since 2013 and just the 4th appearance in program history. No current player on the roster has any Tournament experience. The Bulldogs are led by 4th-year head coach Ben Howland, and they have seen improvement in each of his 4 seasons at the helm, finishing tied for 6th place in the SEC this year. Howland is now in his 4th stint as a head coach, having taken each of his 4 programs to the NCAA Tournament. He is 19-10 in his career in the NCAA Tournament, losing in the first round just 3 times out of 10 trips. Howland began his head coaching career at Northern Arizona, leading the Lumberjacks to the Big Dance in 1998 and 3 consecutive 20-win seasons before moving on to Pittsburgh. In his 4 seasons with the Panthers, Howland advanced to the sweet 16 twice, doing so in 2002 and 2003. From Pitt, Howland was hired as head coach at UCLA, a position he held for 10 seasons before being fired in 2013. At UCLA, he led the Bruins to 3 consecutive 30-win seasons and Final 4 appearances, including a championship game appearance in 2006. In total, Howland and UCLA made the NCAA Tournament 7 times during his 10 years. The Bulldogs are making their 11th trip to the Big Dance and first since 2009. They are 11-10 all-time in the NCAA Tournament with their last win coming in the 2008 first round game against 9-seed Oregon. 8 of MSU’s 10 losses this season have come by 7 points or fewer, with the other two losses on the road to Kentucky and Tennessee, both top 10 teams. The Bulldogs are 7-3 in their last 10 games, with two of those losses coming against the Volunteers, including an 83-76 loss on Friday in the SEC Tournament quarterfinals. 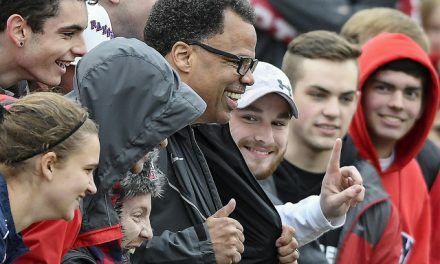 Liberty and Mississippi State faced four common opponents this season – Austin Peay, Alcorn State, Alabama, and Vanderbilt. The Flames were 1-3 in those games compared to the Bulldogs’ 4-1 mark. LU’s three losses came by 9 points each. MSU split with Alabama, winning at home and losing on the road. Mississippi State is led by first-team all-SEC selection Quinndary Weatherspoon. The 6’4” senior guard is averaging 18.2 points per game, good for 2nd in the SEC behind Tennessee’s Grant Williams. Weatherspoon scored 20 or more points in 15 of 33 games this season, including a season-high 31 at Georgia. He’s averaging 34 minutes per game and is a capable shooter, as he shoots 50.9% from the field, 39.9% from 3, and 80.8% from the free throw line. Weatherspoon has averaged double figures all 4 years of his MSU career, including 12 points per game as a freshman. 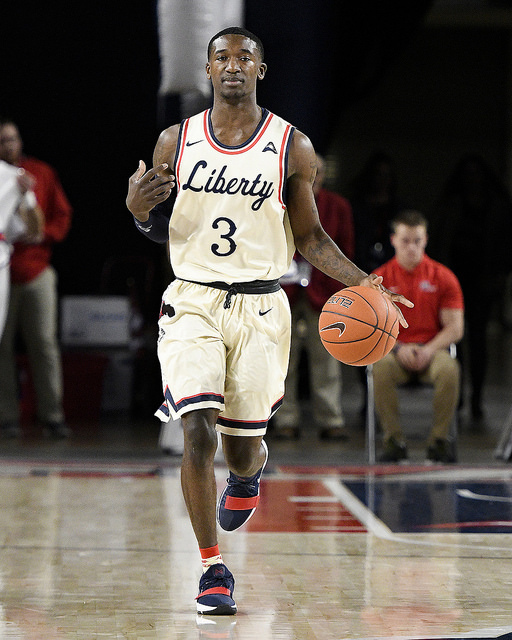 Cabbil has had success slowing down talented guards in his career, most notably Campbell’s Chris Clemons and NJIT’s Zach Cooks. Cooks, a 2nd team all-ASUN selection and the league’s third leading scorer, was held to 8 points on 3-of-22 shooting in two games against Cabbil this season. 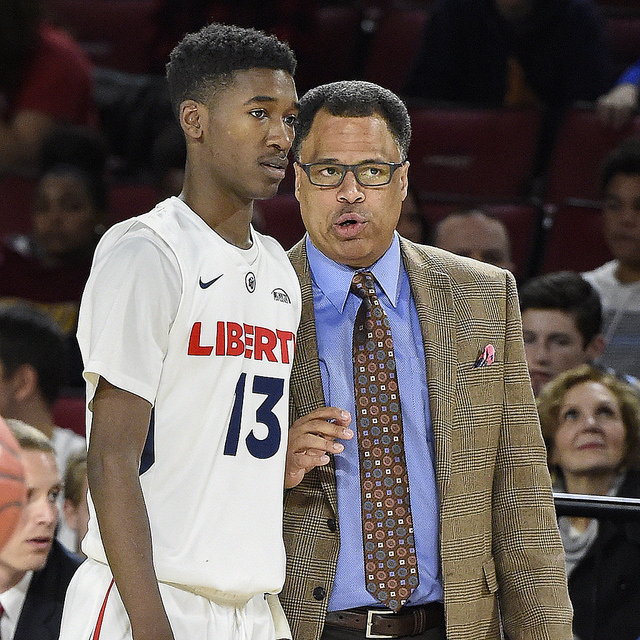 Liberty has faced several talented guards this season. 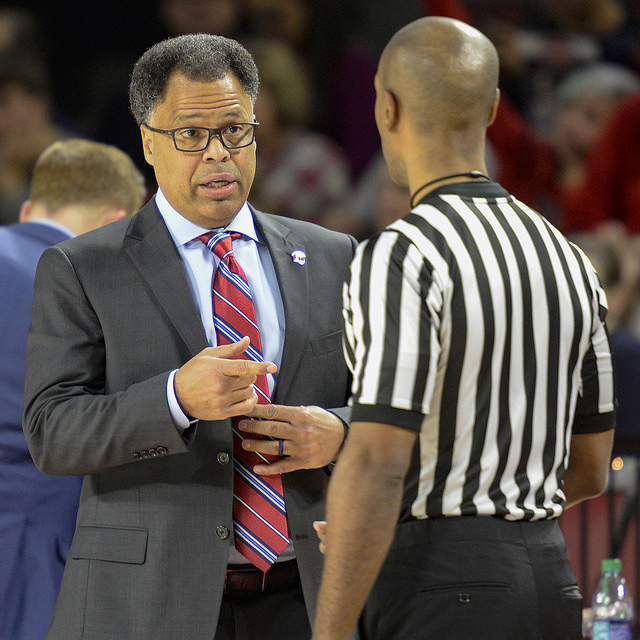 UCLA’s Jaylen Hands, Vanderbilt’s Darius Garland, Alabama’s Kira Lewis, and Lipscomb’s Garrison Mathews are a few names that come to mind, but Coach McKay thinks Weatherspoon is on a different level. The Bulldogs are balanced behind Weatherspoon, with 4 players averaging between 11.7 and 9.7 points per game. 6’0” junior guard Lamar Peters is 2nd on the team in scoring at 11.7 per game while shooting 38.1% from 3. Over 65% of his field goal attempts have come from behind the arc. Peters also leads the team with 5.2 assists per game. 6’4” junior guard Tyson Carter is averaging 10.5 points per game while shooting 36.9% from 3. Reggie Perry was named to the SEC all-Freshman team following a campaign where the 6’10” forward averaged 9.8 points and 7.1 rebounds per game while shooting 50.9% from the field. 6’10” senior forward Aric Holman is averaging 9.7 points, 6.2 rebounds, and has 51 blocks in 33 games while also shooting 43.1% from 3. Carter has been inserted into the starting lineup down the stretch because Nick Weatherspoon was suspended indefinitely for a violation of team rules, causing him to miss the team’s last 9 games. 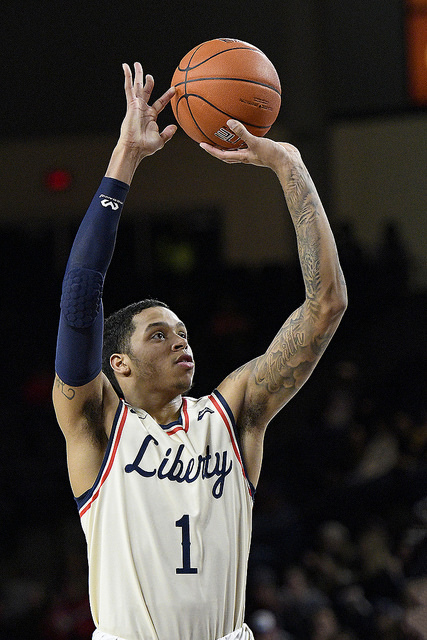 Quinndary Weatherspoon’s younger brother, Nick is a 6’2” sophomore guard who was averaging 9.6 points per game while shooting 38.5% from 3 in the team’s first 24 games. Since his suspension, Howland has been going only 7 deep, with Robert Woodard II and Abdul Ado providing additional depth for the Bulldogs. Woodard is a 6’7” freshman guard who is averaging 5.3 points and 4.0 rebounds per game. Ado is a 6’11” redshirt-sophomore forward who is averaging 4.8 points and 4.5 rebounds per game. Weatherspoon enters the game 3rd on the Bulldogs’ all-time scoring list with 1,985 career points. He and Peters really get the offense going and everyone else feeds off them and their breakdown of the opposing team’s defense. Mississippi State is turnover prone, as they rank 217th in the country with 13.3 turnovers per game while the Flames are 32nd in the NCAA in turnovers per game. The Bulldogs do rank 10th in all of Division I in blocks per game with 5. 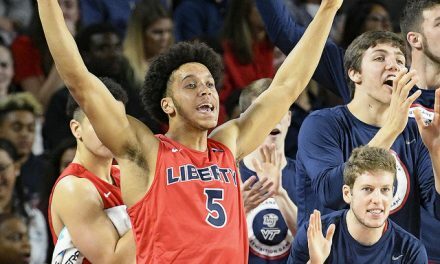 As a 12-seed, Liberty is the highest seeded ASUN team since 2001 when Georgia State was an 11-seed and upset Wisconsin in the first round. In 29 of the last 34 years, 12 seeds have won at least one first round game. Last year is one of the few times when the 5 seeds were 4-0 against 12 seeds. 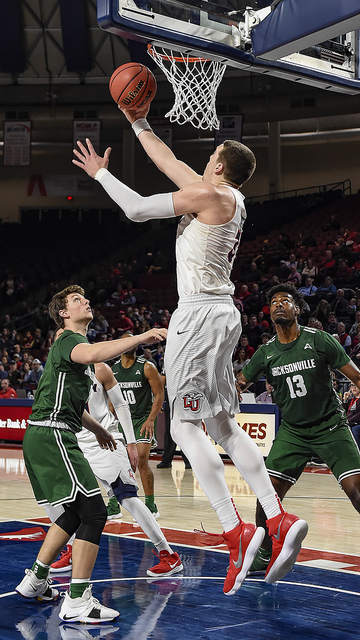 Despite being the lower seeded team and a 6.5 point underdog, the Flames are confident they can pull off another first for the program this season – an NCAA Tournament win.